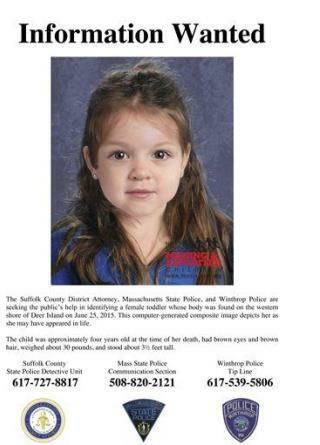 (Newser) – "Baby Doe," the young girl found stuffed in a trash bag on a Boston beach back in June, has been identified. Police say the 4-year-old, named Bella, was the daughter of Rachelle Bond, who lives in Boston's Mattapan neighborhood, reports the Daily Beast; police had earlier linked the girl to the Boston area via pollen samples. Authorities were searching for Bond, 40, and a man, Michael McCarthy, 35, who the Daily Beast says are persons of interest in the girl's death. Officers say someone close to the girl's family contacted police yesterday because Bella hadn't been seen in a while. When the tipster asked about the girl, the pair claimed she had been removed from their care by the Department of Children and Families. Why no photo of the mother and boyfriend so we can see what real monsters look like, instead of a 4 year old angel? Always the boyfriend these whores bring into the lives of their vulnerable children. Too bad for her she didn't murder the baby in the womb. Liberals would be lining up to shake her hand and tell her how "empowered" she is. What a cute kid. Here's hoping hell exists for the sake of those other two.